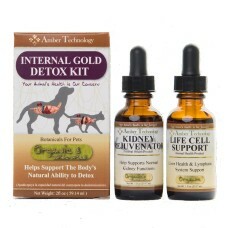 Amber Technology’s internal Gold Detox Kit comes packed with antioxidants that aid dog and cat lymphatic and circulatory systems as well as the liver and kidney functions, which help keep your pet in peak condition. To keep your pet in peak condition use 2 times per year during Spring & Fall. Give both products orally 2 times daily for 30 days. Add 20 drops of each product into every 8 oz of water.